With another “Pi Day” behind us, I thought I’d share a fun method for estimating pi that basically requires a hardwood floor, a bag of sewing needles and plenty of time. Imagine standing over a hardwood floor. Notice the parallel lines between the boards. Now imagine dropping a single sewing needle onto it. It bounces, and comes to rest. Question: What is the probability the needle will come to rest on a line? The picture below illustrates the problem. 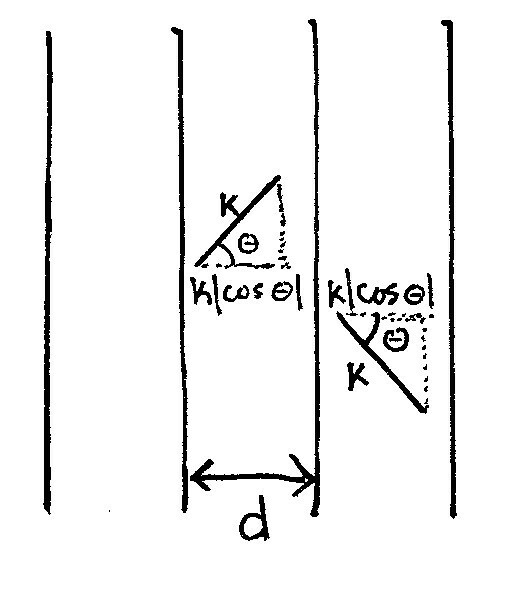 The distance between the lines is marked d, and the length of the needle is marked k. Let’s assume k is less than or equal to d. The illustration shows two possible resting points for the needle. Looking at the picture, it’s easy to see how to approach the problem. All we care about is the horizontal “width” of the needle when it comes to rest, relative to the total distance between the lines d. The ratio of the former to the latter will be the probability of landing on a line. We use the absolute value since physical length is always positive. This is marked in the picture. The key to simplifying this is to note the following relationship between ordinary cosine and the absolute value of cosine. 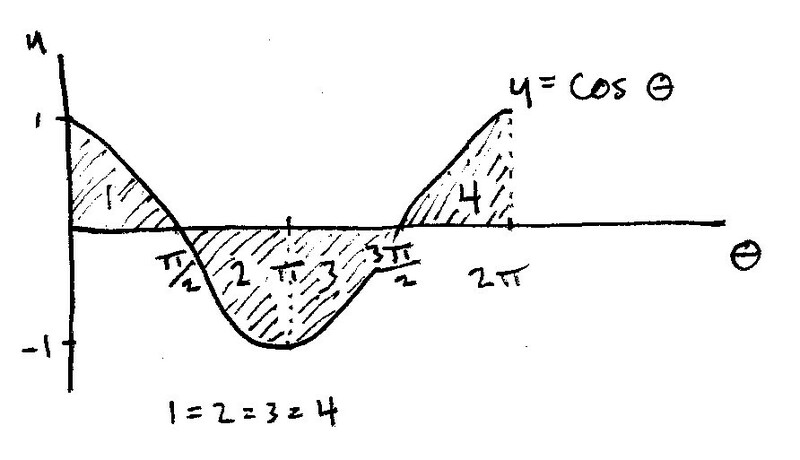 For ordinary cosine, the integral between 0 and 2pi is just zero — half the time it’s positive over that range, and half the time it’s negative. But we want the absolute value of cosine, which is always positive. The picture below illustrates how to translate between the two. as long as k is less than or equal to d.
Now we have an expression we can use to estimate pi. The process is simple. Start tossing needles on the floor. Count how many land on the lines, as a percentage of total throws. That’s P(k,d). Then divide this number into 2. The result will be pretty close to pi. The more needles you throw, the better the estimate will get.